The gist of the SOPA/PIPA bills is to stop copyright infringement. I get that. I have music playing in 14 countries and a hard-copy book that sells globally, but has digital excerpts. I want to be paid when my music is played and my book is read. It cost me a lot of money and time to create those products and make them available. Copyright law is serious business in the U.S. but is practically non-existent in other countries. I know. I deal with international royalty via ASCAP. And, it’s not just music that gets ripped off. Before the days of DVDs, people in India would go to a movie theatre with their film recorder in hand. The next day their pirated copy was available as a video tape or download in segments. Yeah, the bootleg quality was crap, but getting to see it for free, or a small download fee, eased that pain. Now they just stream the copy they ripped straight off the DVD. At least you used to have to be local to get it. Now it’s available to everyone, everywhere, for a small fee of course. I used to get irate when I overheard someone talk about a cool tune they downloaded on Napster. It bothered me to no end that those folks never considered me and my buddies in those conversations. You know, the folks who made those cool tunes. But what bothered me even more was that such a rip-off site like Napster could even exist, or other Torrent file sites that routinely made free software available. No wonder so many of my geek buddies just put their open-source programming stuff out there for free. It was going to get ripped off anyway. You want to help put a stop to SOPA/PIPA? Support those who make your world a better place. Stop expecting everything to be for free, like the music you listen to in the background, or the app you’re using. When was the first or last time you donated to a plugin developer? But you thought nothing of plopping down $2.99 on Amazon for an ebook that you’ll read and delete. The author makes about a quarter on that purchase, by the way. Amazon is the one getting rich. You know that cool YouTube video you just saw and want to share? Don’t spread it around if it has copyrighted material in it, like a song by a famous artist as background music. It’s against the law to publish and distribute such material, and that’s the sort of thing SOPA/PIPA wants to stop. There are already laws for that and you need to stop breaking them too. It’s not okay. If you think it is, you put $10K and a year of your life into creating something and then watch it show up on YouTube for free and see how you feel. This is what I mean about responsible monitoring. Enforce and follow the laws that we already have. And that book you just shared with your whole family – how many sales did the author miss due to your generosity? Think about it. The Internet has helped create an interactive global society. We don’t just hear about the news in other parts of the world, we can get the word directly from the guy who lives on that street. We can also get those bootleg movies from him too. And that’s another arm of the SOPA bill. It wants to stop the transmission of info from servers that distribute that stuff. Well, pirated material is not all the info they transmit. That’s the problem with SOPA. When you read about Google trying to get into China, SOPA may turn that into Google trying to get info into the U.S. That’s a problem. A big one. I already make a ton of the content I create free. I don’t like having my purchase products stolen and others profiting from the sale. I don’t like my buddies living as starving artists/programmers either. But I don’t like the reach of SOPA/PIPA even more. In fact, I find it appalling. How about we make this a grass roots effort and police ourselves. Peer pressure goes a long way. Look around your life and see what you’re ripping off and expecting to get for cheap or free. Who created that product and how are they paying their bills? Where did the product originate online? Do you know if somebody was ripped off to deliver it to you? It’s super easy to hate the government these days. In fact, it’s in vogue. 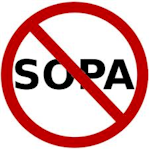 The root of the problem is not something SOPA/PIPA can fix. Thanks to everyone who voiced their concern and took action to sign petitions and contact their congressional representation and helped to put a halt on these bills. Yay us! Now take all of that conviction and put a halt to your complacent attitude that allows the producers of digital media to get ripped off by yourself and those you know. You hit the nail on the head here, MaAnna. I am participating in the protest today, but I like they way you think. Especially the part about supporting the efforts of folks who DO give things away for free. As someone who supports open-source on principle, your challenge resonates. Off to make donations to the folks who give it up for free. Thanks for sharing the yoga class story, Jami. The attitude we need to change applies to more than the Internet. Even a small donation makes a difference to the one making it possible/available. Agreed! If you benefit from an open source product, and you can’t find the means to donate something, be it $5 to $100, you are actually part of the problem. How is it that we know we should put a dollar in the donations box at the local mountain bike trail, but we can’t seem to grasp acting in kind online? Great post! I’m of the mind that blackouts and one day gimmick acts don’t do much. If there are increased messages sent to congress, that’s great. But you hit on the golden rule, which is the only way there will be change. Thanks for your comments Mallie. It’s tough to believe that most folks don’t have a few bucks to donate once and then use the thing forever. But, I think the going dark thing did bring awareness, especially globally, because there are lots of dollars at stake for these overseas torrent sites and their biggest consumer is the U.S. I think this sends a message to them that some sort of regulation is on the way and those consumers are more aware of what the entire bill is about.